Earlier this morning, our coworker and his vehicle were recovered from the Hood Canal. I would like to extend my sincere thanks to everyone involved in this difficult, emotional undertaking. Our attention will now turn to supporting our coworker's family and supporting the Hood Canal Bridge crew as they return to their normal duties. The Washington State Patrol will publicly release our coworker's name once the family has been notified of a positive identification. It may be some time before we learn what caused this tragic event, and indeed we may never know. What I do know, and what I am extremely proud of, is the compassion, courage and respect with which WSDOT employees have responded to this accident. Those who knew our coworker will remember him as a champion for safety. He will be remembered for his willingness to respond to any need at the bridge, to help other employees with tasks, and to be fully involved in his job. We will find a way to move forward from this tragedy, as we have no other choice. However, we will hold his memory close to our hearts and minds, as we do with all our fallen coworkers. 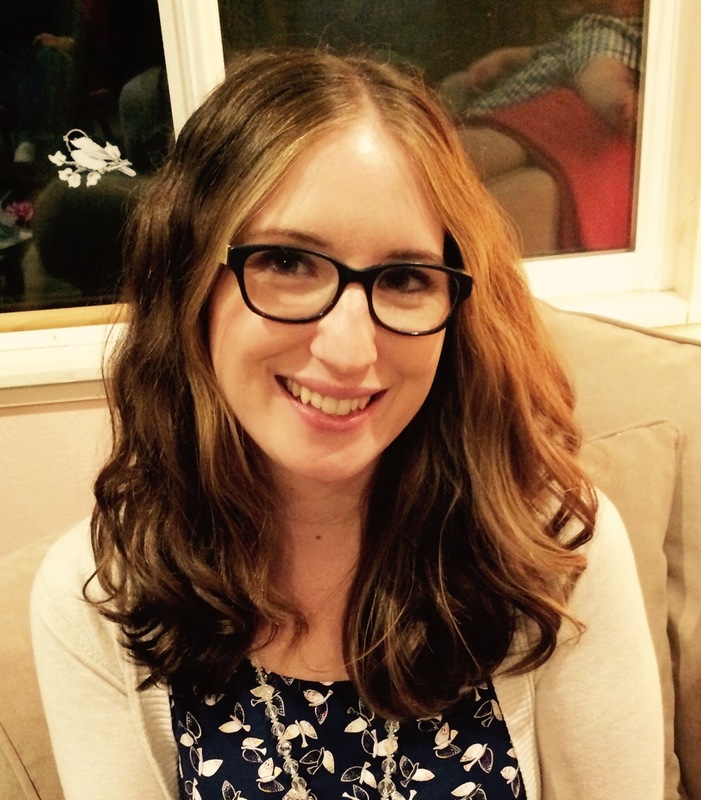 "These last 10 days have been the hardest days our collective family has had to face. We are united in extending our gratitude to the search crews who have worked so many long hours to recover our loved one, and to the WSDOT Hood Canal Bridge crew and management for their kindness and compassion throughout this ordeal. We know our loved one's name will become public soon. We appreciate the media's patience to date, and even after his name is known, we will continue to ask media to respect our family's privacy by not contacting us and instead using this statement as our response. As we move forward to put our loved one to rest and begin the healing process, we thank all those who have extended thoughts, prayers and condolences." Thank you all for your kindness and support during this time. We’re about six weeks out from the start of weekend lane reductions on southbound I-5 in the Tukwila, SeaTac and Des Moines areas. Southbound I-5 will be reduced to two lanes from Friday nights through Monday mornings the weekends of July 8-11, 15-18 and 22-25, and Aug. 12-15 and 19-22. 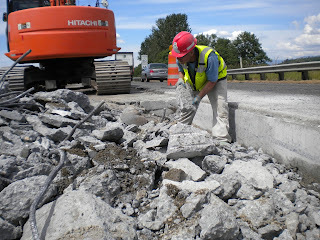 A concrete cracking machine used on one of our projects in Skagit County in 2011. The work is part of the southbound I-5 South 320th Street to Duwamish River Bridge concrete pavement rehab project. For the past couple of months the crews have been working nights, replacing concrete panels and grinding ruts and cracks over this 13-mile section of freeway. The work is scheduled to continue until fall 2017. Replacing 235 panels scattered along the 13-mile section of I-5 and grinding the concrete with nighttime lane closures works for most of this project. But a 2.7-mile section in the SeaTac-Des Moines area needs more than that, so during three weekends in July we’re repaving it with asphalt. Our contractor will use the first two weekends to replace 96 concrete panels with asphalt to create a smooth transition area. On the third weekend they’ll repave the rest using a process called crack, seat and overlay. What’s that? It’s pretty much what it sounds like. A crew member helps remove a concrete panel on a different project. Our contractor will use a large concrete cracking machine with a heavy blade that drops like a guillotine, cracking the concrete panels into smaller pieces. Then a 35-ton compactor rolls over the cracked concrete to “seat” it firmly. Finally, we will overlay this with asphalt, creating a new, long-lasting smooth driving surface. Why do you have to reduce the freeway to two lanes on weekends to do this? Working entire weekends without interruption gets the project done much more quickly. Why do you have to crack the concrete to put asphalt on top of it? You’d think a 12-foot by 15-foot, nearly foot-thick slab of concrete won’t move. Actually, they do move, especially after decades of cars and large trucks rolling over them. If we put asphalt on top of the panels without cracking and seating them first, those panels would continue to move, which would crack the asphalt. Cracking and seating the concrete provides a much more stable base. Why are you only doing this on a 2.7-mile section of the freeway? The 2.7-mile section between SeaTac and Des Moines has more than 500 broken panels. We could replace each of these individually, but that would take years. Doing crack, seat and overlay repairs this section in a few weeks. What are you doing during the two weekends of lane reductions in August? 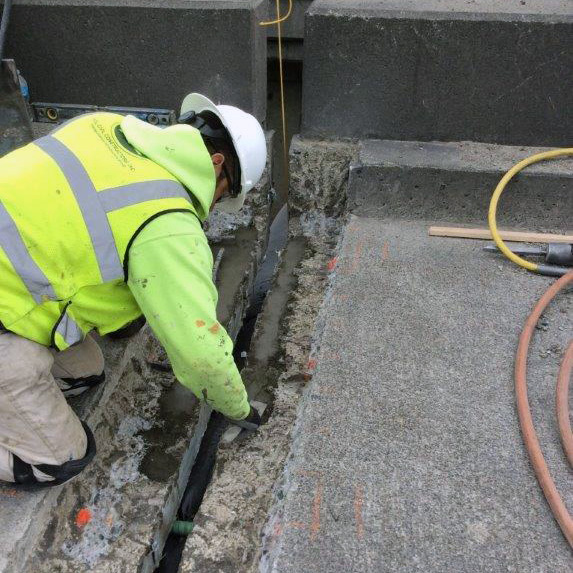 Our contractor crews will replace four expansion joints on the southbound I-5 Duwamish River Bridge. They’ll also do drainage repair and panel replacement near the bridge during one of those weekends. There are a lot of activities every weekend. Don’t you look at those when you schedule weekend work? Yes, we consider events very carefully. We’ll discuss that more in our next blog about this project. It’s a bird, it’s a plane...it’s a remote controlled lawn mower?! It's easy to get distracted by cool, new technology. If you've ever been around someone using a drone, you know what we mean. But lately, our maintenance workers have noticed drivers getting a bit too interested in some of our roadside work. Our maintenance crews are using remote-controlled lawn mowers, and they've been turning some heads, which isn't necessarily a good thing. Our remote-controlled lawn mower is able to safely handle areas that might be hazardous to our workers. The remote controlled lawn mowers kind of look like mini tractors with no one behind the steering wheel. That is, if there was a steering wheel, which there isn't. A ghost-driven lawn mower? No wonder the head turning, right? 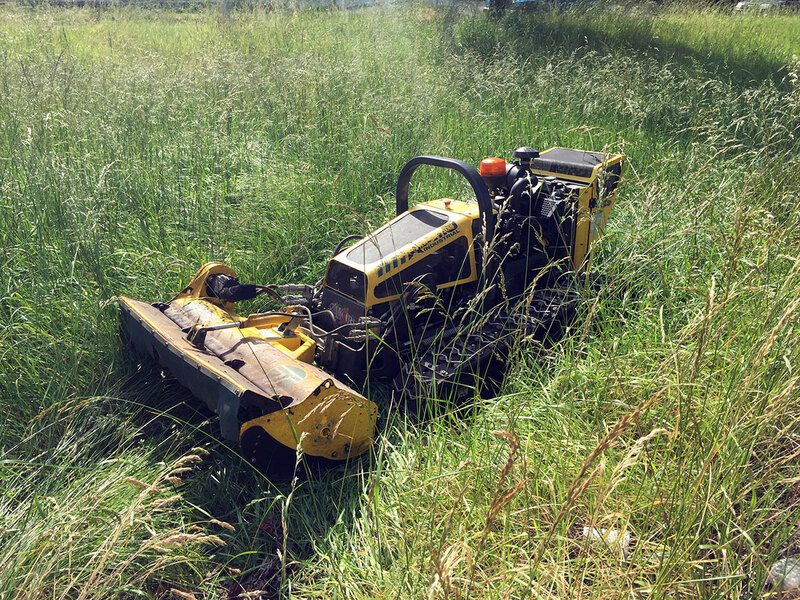 Unfortunately, with the head-turning comes some close calls, and drivers have actually been pulling over into our work zones to ask questions about this intriguing grass-cutting gadget! While we love talking about the work we do, a work zone really isn't the best place to do it, and distracted driving is the last thing we want to see. So we thought we'd share some information about the mowers – along with a nifty video of them in action – so you can keep your eyes focused on the road when you see them in person. 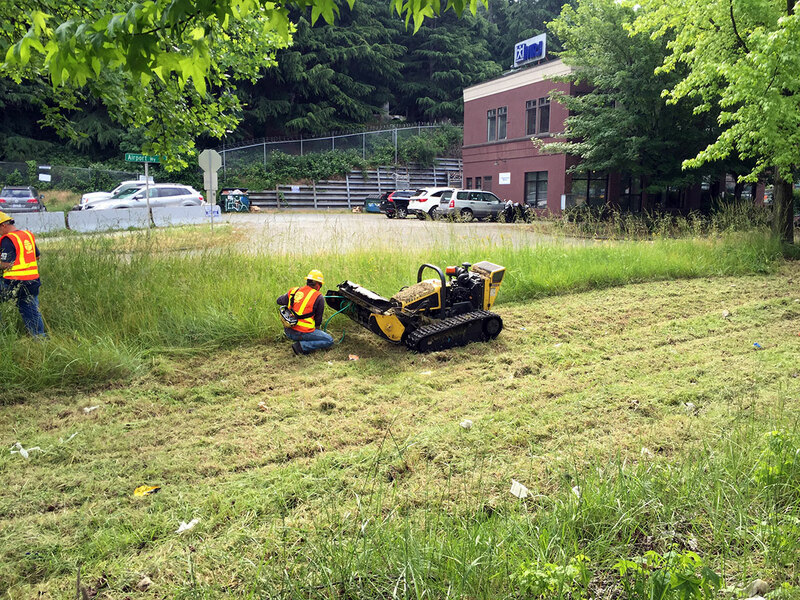 Here's the story: We own two Alamo Traxx RF remote controlled lawn mowers and use them in dozens of locations, primarily in the Seattle area. Our first one went into service in October 2013 and the second started clearing our right-of-ways in September 2015. The remote-controlled mower can easily move over most debris, but a rubber hose presents a challenge. Luckily, it's easily removed. 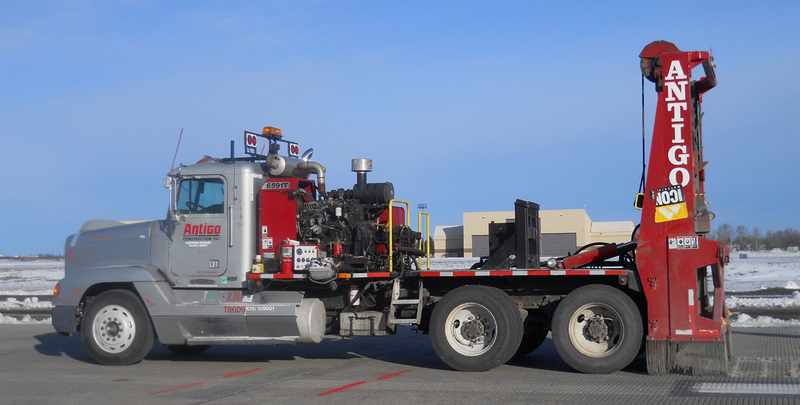 There are three significant advantages for having these 80-horsepower devices: safety, mobility and efficiency. Many of the areas we mow are littered with all sorts of things hiding under the tall brush. On a riding mower a lot of that stuff – like rocks or sharp plastic and glass – can kick back up and hurt our crews. With a 1,000-foot range, the RC mowers allow operators to stand at a safe distance. You've likely seen some of the steep slopes along our highways – especially along I-5 in downtown Seattle. Can you imagine how nervous you might be riding a lawn mower in some of those areas? Armed with rubber tracks with steel cleats and spikes, combined with a low center of gravity, our remote controlled mowers can handle up to a 60-degree slope without rolling over. Even though it's smaller in size than a traditional riding lawn mower, the RC units allow our maintenance crews to cover more area in a faster amount of time. That's because the RC mowers can cut taller and thicker grass and there's even an attachment that allows it to cut through heavy shrubbery – including the always tough blackberry bushes. The mower controller has a few more switches and buttons than an Xbox controller. These $80,000 machines can't cut through everything. A few things – like rubber water hoses – will get caught in the blades. But, untangling the hose from an RC mower is much faster than with a riding one, allowing our crews to get back to work faster. Summer is almost here and our RC mowers will be out in force. We agree they're pretty cool to see, but please keep your eyes on the road when you pass one, and let our workers keep their eyes on the machine. Very early Monday morning, search crews confirmed that they found the missing vehicle and our employee about 150 feet north of the bridge. While this news sadly confirms our tragedy, the unknown is now known and we can move forward with a plan to recover our coworker. The vehicle is submerged in over 344 feet of water and recovery operations will be as deliberate as the search was. We are relying on experts from Global Diving and Salvage, a Seattle-based company, to guide this effort. Today will be spent creating a recovery plan. The timing of the actual recovery will depend on what equipment needs to be mobilized to the site and marine conditions. We of course must still work around the tides and currents, which can make the process frustratingly slow. Once the vehicle and our employee are recovered, the Washington State Patrol will once again take the lead on the investigation. We are continuing to honor the family’s request to not release the employee’s name until positive identification and formal family notification can take place. Rest assured, however, that we are in frequent contact with the family and they are aware of our progress. 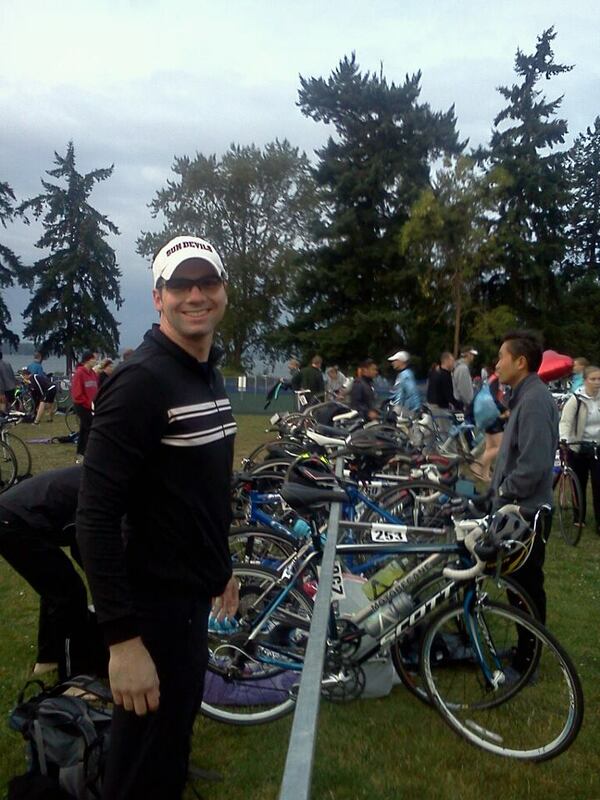 For those wishing to help, the best way is to contribute to the WSDOT Memorial Foundation. The Foundation provides WSDOT a mechanism to tangibly help extended WSDOT families manage the financial consequences of the loss of a loved one. We appreciate everyone’s thoughts during this difficult time. June 16, 2017 UPDATE: Our Vancouver area herd of four-legged weed warriors is on loan, helping to clear vegetation under the Portage Bay Bridge in Seattle. The kids were deployed on Monday, June 12, and immediately started grazing. Goat power has decidedly less greenhouse gas emissions, is more environmentally friendly and frees our maintenance staff up to do other roadway maintenance work. May 20, 2016: Last summer we used goats to wage war on weeds in three areas across the state. How did our four-legged weed whackers do? We're not ready to buy our own herd, but we are still interested in goat mowing. It turns out that goats, aside from being seriously cute, are effective weed control in certain, specific locations. Our Vancouver-area pilot project, for example, worked so well that officials in the greater Seattle-area are now investigating doing the same. kiddos will join the heard once they've put on a few pounds. 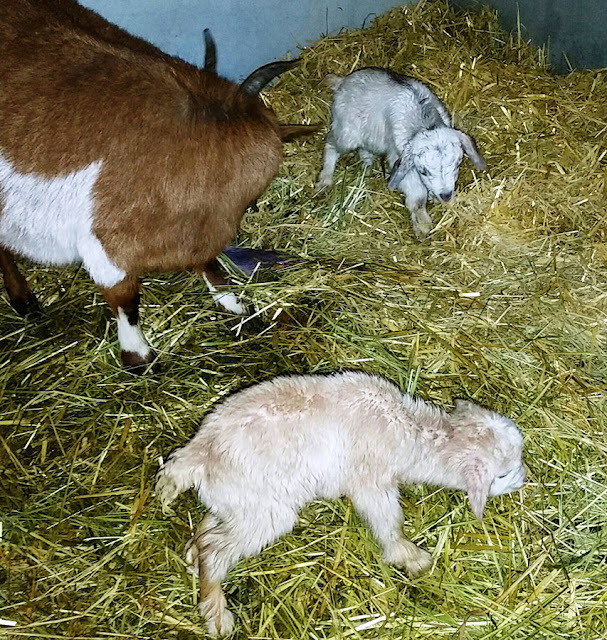 The goats kept weeds in fenced stormwater facilities near Vancouver under control as well as traditional methods by our maintenance crews and would be slightly cheaper – about $300 less per acre according to our overall estimates. (For the pilot the goats were donated by an employee, but we used contractor quotes for the cost estimates). Goats also are much more environmentally friendly than gas-powered mowers and, in rocky terrain, can reach some areas easier than our crews. Not every goat weed warrior assault was as successful, though. 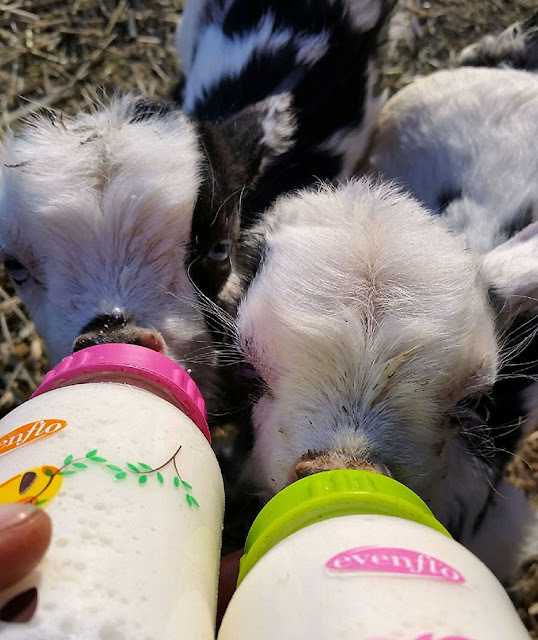 In our Olympia and Spokane roadside locations, contracted goats and herders cost more than traditional methods of mowing and spraying with herbicides – especially if extensive fencing is needed as it was in Olympia. Costs with the contractor in Olympia were $11,993 per acre, compared to $4,574 if our maintenance crews had cleared it with mowers and other equipment. (Those costs also included traffic control crews to shut down roads to load goats in and out of the location.) In Spokane, the contracted goats and herder cost $395 more per acre compared to having maintenance crews to do the work. In addition, traditional mowing and herbicide methods were deemed better at clearing and controlling vegetation overall in both locations. Goats might still be considered in certain roadside locations and situations – if herbicide is prohibited, for example – but overall likely won't be used often in these types of locations. Mary and Joseph. 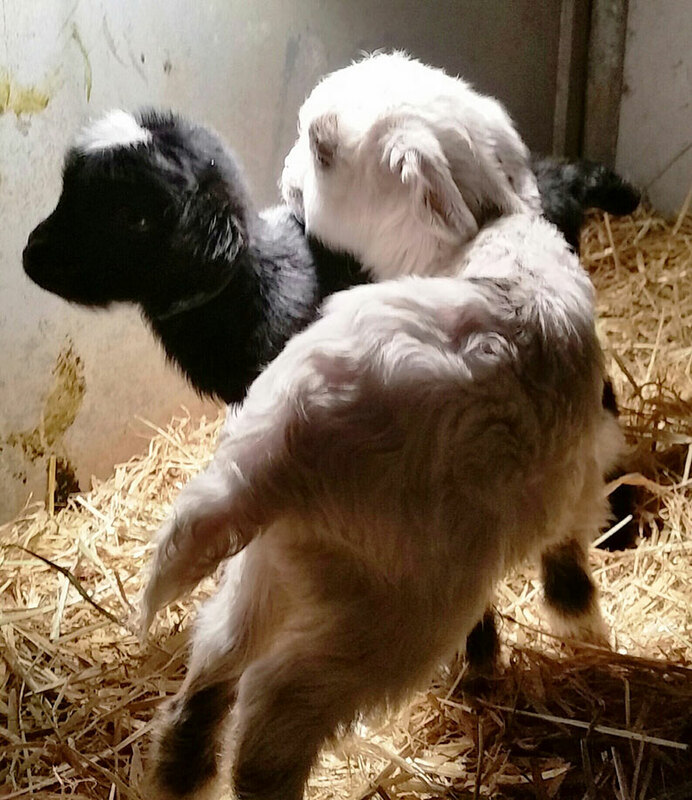 They were born on Christmas Day 2015. So, are we sold on goat power? We plan to use goats as one of many tools in our vegetation control tool box – when and where it makes sense. Goats may not be a frequent tool, but they will remain an option to our crews. 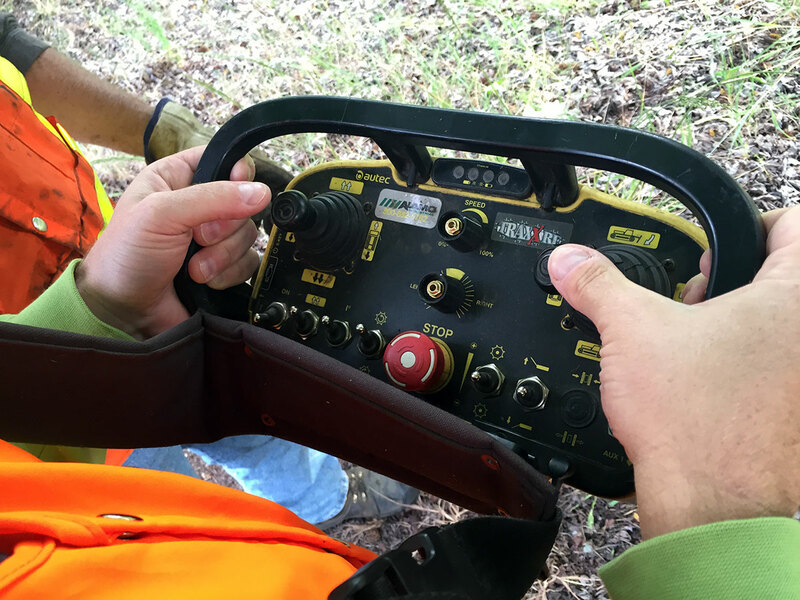 Vegetation control often requires a multi-prong approach, so more options certainly helps our efforts. on their hooves they'll join the herd in Clark County this summer. Last summer's study was also a chance to develop good cost-benefit numbers for goat use both for ourselves and other states. From that standpoint, the pilot was a success, identifying areas where goats work well, areas where they're more challenged and other issues – such as liability, union buy-off and the need to solicit bids and develop an on-call list of goat contractors for when we need them – that still need some refining before goats can be used long-term. We hope it helps others make the best decisions possible for their own agencies. It also will be shared with the national Transportation Research Board. In the meantime, the photogenic goats in Vancouver – including some new babies -- are getting ready for another summer of grazing – and their next close up. In the month that we celebrate the eight-year anniversary of the State Route 167 High Occupancy Toll Lanes Pilot Program, we will be replacing some of the toll equipment that has reliably served its purpose since 2008. The SR 167 HOT Lanes were originally a four-year pilot program that the Legislature has extended multiple times. The project is managing congestion and allowing solo drivers with a Good To Go! pass to buy into the lanes for a more reliable trip, while also maintaining reliability in the corridor for people in carpools, vanpools, and buses. In addition to planned replacements for older toll equipment, we will be replacing the SR 167 HOT lanes system server so that it can be better integrated with the system on the I-405 express toll lanes. This will have no effect on the I-405 express toll lanes, but will allow us to better integrate these two systems in the future. 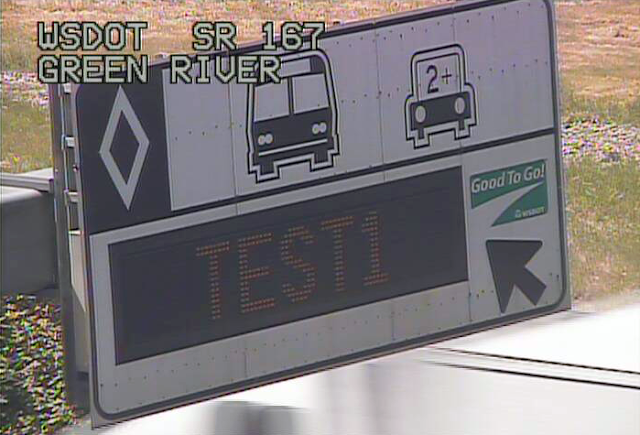 Drivers may see messages like this this weekend as we upgrade our SR 167 tolling equipment. The new system was just commissioned last year, so the technology is light years ahead of the 2008 technology. It will keep the toll rate signs from going blank, as they have been doing intermittently for the past few months. It will also allow us to better match toll rates to traffic conditions, easing an uptick in congestion that drivers have experienced recently. To make these changes, you'll see some activity out on SR 167 between Renton and Auburn this weekend. Friday night, southbound SR 167 will be reduced to one lane by midnight, with all lanes reopening by 7 a.m. Saturday. On Saturday and Sunday nights, northbound travel will go down to one lane by 11 p.m., with all lanes reopening by 8 a.m. on Sunday and 5 a.m. on Monday. During the Friday night closures you might see test messages and toll rates on the signs going southbound – that's just our engineers testing the signs. Of course this won't affect any drivers because the toll lane will be closed. As always, you can check for closure updates on our King County Construction Updates page. Thanks to all the overnight drivers for your patience while we work to make these changes. Each cyclist on the street has a different story as to why they decided to saddle up and use pedal-power to get from point a to point b. It may be for the pure joy of the ride, a romanticism of the roadway via two-wheeled transport. Others, it may be to incorporate more physical activities to improve or maintain their health. And some believe they are doing their part to reduce urban congestion by removing themselves from the driver's seat. It's personal. Regardless of the reason, their common bond is that they are playing a greater role in the transportation picture. For me, it was a gradual shift that was sparked by riders I'd see on Dexter Avenue in Seattle about five years ago. I had been a runner, but there were fewer opportunities to exercise with a new baby in the house. My blood pressure was also on a steady incline, and my doctor had warned me that a prescription may be needed if this trend continued. To fix this, I did a little math and figured that for the time I spend in the car commuting, I could make the same trip riding and get two workouts in a day. Encouraged by a close friend and coworker, I went all in and bought a bike. Just from the commutes I've tracked, (I've missed logging the occasional ride), I've pedaled just over 7,500 miles to-and-from work and my blood pressure is now normal. 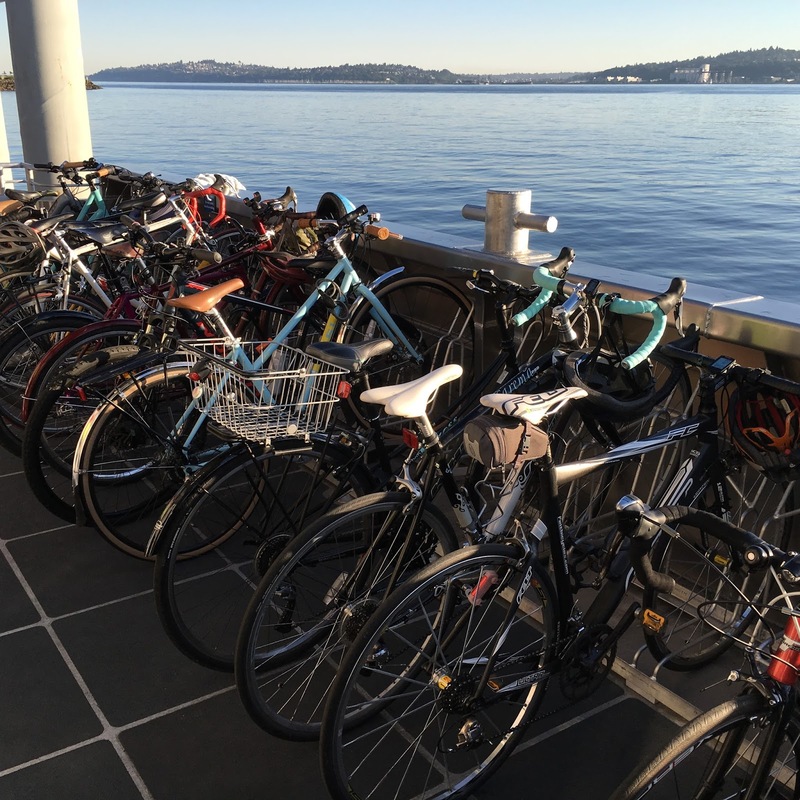 WSDOT employees look forward to Bike to Work Day every year. This year's is on Friday, May 20. Ideal outdoor weather in the Pacific Northwest crescendos in the spring and peaks in the summertime, leaving a mixed bag for us to try to plan around during the rest of the year. This is why May is a perfect time for Bike Month, where everyone is encouraged to give cycling a spin – not just biking to work, but #BikeEverywhere. It may not be realistic to incorporate biking into your everyday transportation repertoire, but when you use this option, it helps keep people moving with the reduction of that vehicle from the roadway. 7,500 miles to his job since then. Know the rules of the road – Cyclists riding on the street have all the rights and responsibilities as the driver of a motor vehicle. You can find more details on our Washington State Bicycle Laws webpage. Set yourself up for success – Be comfortable on a bike, and make sure your ride is in good working order and you have the proper safety gear. If it's been awhile, take it into your friendly neighborhood bike shop for a checkup. Know your route – Many cities have bike lanes and paths that make riding easier and safer. There are some maps on our website, but you should also check locally to see what's available. A seasoned bike-commuting coworker is also a good resource. What you may discover through this is that bike commuting can become addictive, and those who are hooked have often pedaled through puddles during the rainy season to get their fix. Whatever you decide, please remember that regardless if you use four wheels or two, we all have a stake in keeping people moving. Have fun, and share the road safely. Driving between Tukwila and Federal Way you may notice that new concrete panels are appearing overnight, as if by magic, at several locations. Once the concrete panel is removed, the subsurface is prepared. 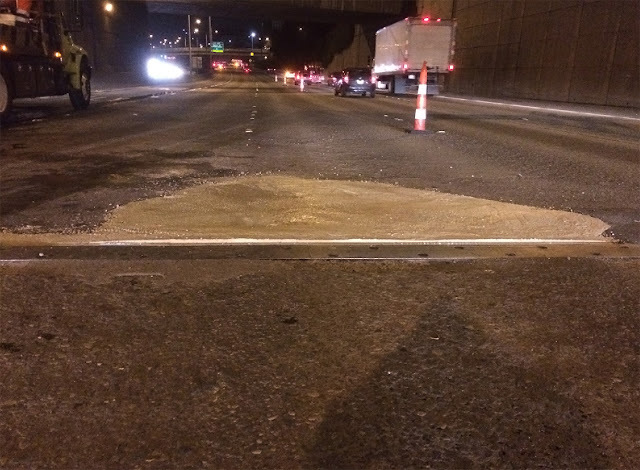 It’s not the work of elves – it’s part of our southbound I-5 South 320th Street to Duwamish River Bridge pavement rehabilitation project that started about six weeks ago. Sunday through Thursday nights, our contractor crews have been replacing broken concrete panels. The crews are also repaving some asphalt sections and have started grinding areas that are still in good shape, except for ruts from 50 years of carrying cars and trucks. Starting at 8 p.m. most weeknights when traffic starts to diminish, crews begin to close lanes on southbound I-5 so they can replace a few of the more than 230 broken panels between the Duwamish River and Federal Way. Crews place a liner before the new panel is poured. Cut the panels up with a concrete saw. Remove the pieces of the panel. Prepare the hole for the new concrete. Pour the quick setting concrete. Reopen the interstate by 5 a.m.
Once the new panel is poured, it needs time to cure before traffic can drive on it. Crews will replace three to six panels in a night, depending on where they’re located. Typically the panels are cut a night or two before they are removed to save time. 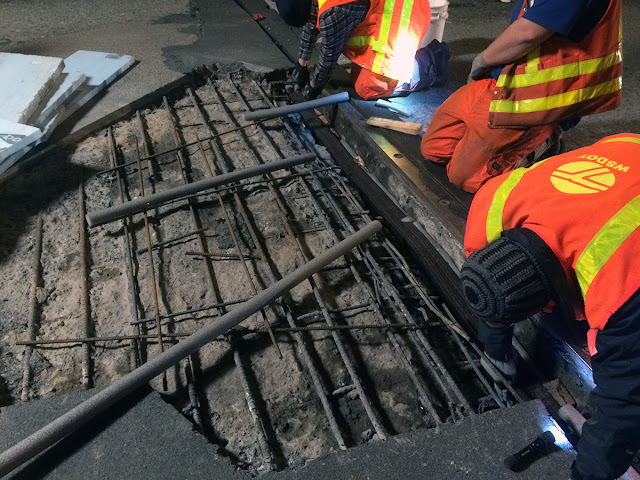 Once the crews begin to take out the panel, they’ve got to get that hole filled in with new concrete in time for morning traffic, so you can see they have to work quickly and efficiently. before traffic can drive on it. Recently our contractor crews also started to grind lanes in the Des Moines area to remove ruts created by 50 years of traffic. Grinding out the ruts and small cracks will keep water from pooling, providing better traction. Grinding is a noisy process because they’re grinding up concrete, and there’s no quiet way to do that. If you’ve ever worked with wood and used a power planer, that’s exactly what we’re doing to I-5. Of course, our contractor’s grinders are much bigger – they mill a thin layer of concrete about four feet wide, moving at about 10 feet a minute. Sometimes it needs to make two passes over an area to smooth it out. Throughout this project our contractor will grind much of I-5 between the Duwamish River and Federal Way. pavement in South King County. The I-5 overpass above South 336th Street is paved with asphalt, as are several ramps in this project area. In addition to rehabbing the concrete, we need to repave the asphalt sections. This means grinding out about two inches of asphalt and repaving those areas. We’ve already ground out the South 336th Street overpass and we’ll be putting down new asphalt next month. Grinding and repaving the ramps also will be done this summer. Replacing concrete panels, grinding concrete and repaving asphalt sections are only some of the work we’re doing to rehabilitate southbound I-5 from the Duwamish River to Federal Way. This summer we will repave a 2.7-mile section of southbound I-5 using a process called crack-and-seat. What’s that? We’ll tell you about that process, and what it means for southbound I-5 traffic, later this month. Stay tuned! Issaquah drivers endured a longer than normal commute as Front Street remained closed for an extended amount of time as WSDOT’s contractor worked to remove a 114-foot-long damaged girder in the I-90 Front Street overpass with two massive cranes. We would like to send out a big thank you to drivers who found themselves in the middle of the extended commute this morning. Removing the damaged girder proved to be more time consuming than our contractor had anticipated. 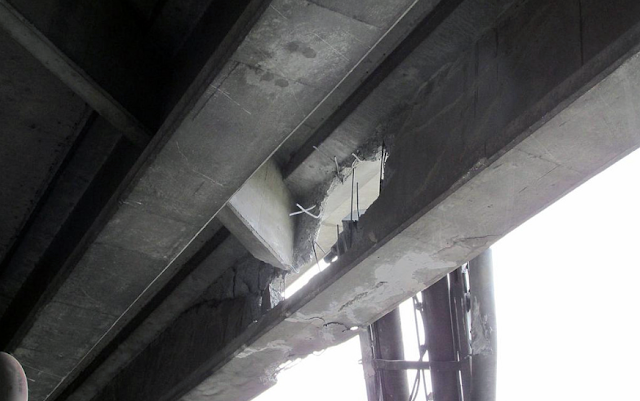 Work to replace this damaged girder on the I-90 Front Street bridge in Issaquah Thursday took longer than anticipated. I may or may not have a blog later from Bart about bike to work. Waiting on some art for it. To keep drivers safe, Front Street had to remain closed until our contractor removed the damaged girder. Once the girder was removed, the contractor needed about an hour to safely remove the cranes from the work zone before reopening the roadway at 9 a.m.
Front Street will close tonight, May 12, from 10 p.m. to 5 a.m. for the third and final time so that our contractor can finish installing the new girder. WSDOT construction engineers will be meeting with the contractor today to review the events that led up to the late opening, and develop a plan that ensures lanes are reopened on-time Friday morning. If you follow us on social media, chances are you've seen the exciting work of our Incident Response Team (IRT). Sometimes referred to as “super heroes,” IRT crews help keep our roads clear and safe using mighty vehicles that can push a stalled bus off to the shoulder and out of traffic. One of those trucks got added fame and recognition during the recent Alaskan Way Viaduct #99closure for clearing a rollover crash that was blocking all but the HOV lane of northbound I-5 in downtown Seattle. Our IRT Program has been around for more than 35 years and is not going anywhere. With the viaduct back open, not much has changed. We continue to have up to 12 crews patrolling roadways in King and Snohomish counties, working closely with our traffic management center and Washington State Patrol (WSP) to locate and respond to incidents. We also continue to collaborate with partner agencies like the Seattle Department of Transportation (SDOT), transit agencies and police and fire departments, in deciding the most effective way to serve commuters. In fact, many of these groups regularly participate in a monthly coordination meeting that includes towing companies, an important resource in incidents our IRT cannot clear – like huge semis. Any time a major roadway is blocked for a long time – or closed for roadwork – we see added congestion on other routes. That's why we worked with SDOT – like we often do – to beef up our IRT resources a bit while the SR 99/Alaskan Way Viaduct was closed for tunneling work. We had our crews start earlier and end later. We also had an extra truck manned near the viaduct. SDOT had three incident response units to help clear city streets – and as always, we were ready to shift some of our IRT units from I-5 to SR 99 – at least the sections still open to traffic. Our IRT crews responded to more than 50,000 incidents across the state in 2015, clearing most of them off the road in 13 minutes or less. As much as we would like to have our IRT actively patrolling every state roadway around the clock, resources are limited to a biennial budget of $9 million, which also includes service in Tacoma through Olympia, Snoqualmie Pass, Spokane, Chehalis and Vancouver. We can shift our crews to just about anywhere if needed, but we strategically focus our IRT coverage on certain corridors based on hours of congestion, freight routes and economic impacts. And that's because the cost of delay is about $300 for each minute we have an incident, according to estimates based on research from the University of Washington's Transportations Center (TRAC). Based on this data, the economic benefit of our IRT Program was more than $80 million in 2015. We're hoping that benefit increases even more when we add more IRT units to the I-5 corridor across the state. Passed earlier this year, the governor's supplemental budget included $10 million to purchase, operate and maintain 10 additional IRT vehicles along I-5 from Vancouver to Blaine. 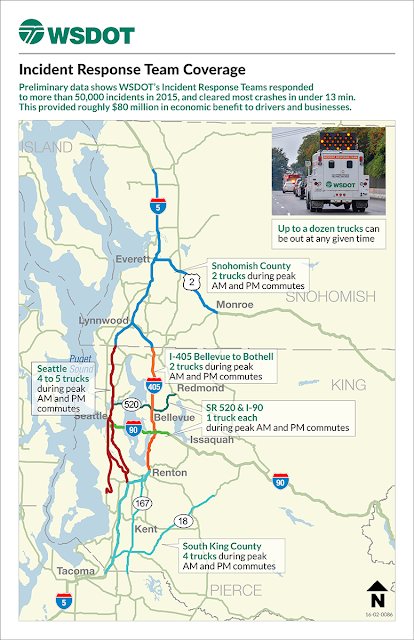 With six of those trucks planned to focus their efforts on the Seattle area, we're hoping to save commuters even more time and money! Get rid of a lane and traffic flow will improve. You don't hear those words very often. But in the case of the SR 202 roundabout at the eastbound I-90 ramps in North Bend, less is better. We installed a two-lane roundabout at the interchange in October 2007. While it has allowed traffic to flow more smoothly compared to the original stop-controlled intersection, drivers entering the roundabout from SR 202 in North Bend tend to use the wrong lane within the roundabout and cause confusion for others. To make the roundabout easier to navigate and reduce the risk of collisions, we will be reducing the two-lane roundabout down to one lane along three-fourths of the circle from southbound SR 202 to the eastbound I-90 on-ramp. A single-lane roundabout is pretty basic. Slow down as you approach, yield to vehicles already circling before entering, and then drive counterclockwise to your exit. A double-lane roundabout works the same, except drivers must choose a lane as they approach depending on where they are heading, and then yield to two lanes of traffic in the circle before entering. After the roundabout opened to traffic, we observed a large percentage of drivers making wrong lane choices, especially those entering from southbound SR 202. So we wished to simplify the driver's task. In 2011, we reduced the number of lanes entering the roundabout from that direction from two to one. This lane reduction was our first step in simplifying and scaling back the original two-lane roundabout complexity. That restriping project improved operations at the roundabout, but still allowed southbound SR 202 drivers the freedom to choose a lane once they entered the circle. In our recent observations, almost 60 percent of drivers are using the wrong lane when exiting the roundabout to the eastbound I-90 on-ramp. The drivers are circulating in the inner (left) lane. Then as they leave the roundabout, cross the path of those in the right circulating lane – a roundabout no-no. Drivers should choose the correct lane upon entering a roundabout and stay committed to that lane until they leave the roundabout. The observed crossover-error causes driver confusion and increases the potential for collisions. Many of you have shared your concerns and suggestions about the situation – from colorful pavement markings to added signage for those who don't use this roundabout regularly. In the end, we decided getting rid of a lane within the circle would help clear up confusion for all drivers. Just like the last time we removed a lane here, our recent vehicle counts and traffic analysis for future volumes show one lane will be able to handle traffic at the interchange without added congestion. Work on this low-cost project is scheduled to take place from 9 a.m. to 3 p.m. Wednesday, May 11. Drivers can expect single-lane and shoulder closures within the roundabout, with minimal delays. The new striping will use thermoplastic pavement markings, a much longer lasting and durable pavement marking material than paint. Also proven – roundabouts reduce collisions and provide a safer way for pedestrians and bicyclists to navigate traffic. And that's why we've been adding more and more of them and some of you may have even noticed them popping up all across the country. In this case, more is better. This morning I was back to riding the bus now that the #99closure is in the rearview mirror. The water taxi wasn’t as fast as an express bus during the #99closure, but it provided a great view across Puget Sound. Conclusion: The King County Metro 21X bus was the quicker way to get downtown from our particular starting point. 7 minutes faster than the water taxi during the #99closure. 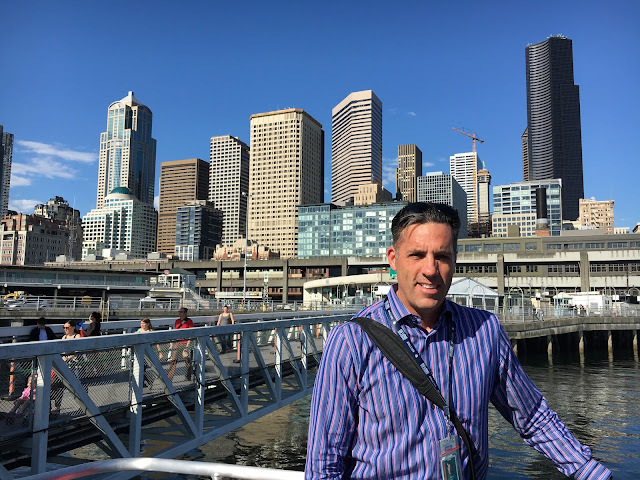 Although the water taxis cuts through the red tape of red lights and messy traffic – and includes some lovely time on the Elliott Bay – the bus, with its more-frequent departures, still gets you where you want to go quicker – even when ripple effect of the #99 closure showed its ugly face. I was happy to catch my usual bus this morning and am looking forward to some extra sleep in the mornings this week. Hopefully any future closures will run as smoothly as this one! It was fun trying the water taxi for a spell. Now that I know the essentials, I’ll be more apt to use it in the future. Although it means more walking and is bound by two crossings an hour, the water taxi is more pleasant to ride. And more scenic. The commute home on the water taxi outpaced the bus a few times but we be never really agreed to officially measure our going home time essentially because my office is close to the pier 50 in Seattle. Nearly all of my sailings had a least 200 passengers aboard and one of my commutes home hit the 278-person boat capacity. I’m sorry I didn’t get to say goodbye to my new friend the water taxi when the viaduct opened this morning. I’ll visit it for a commute when the time is right in the future. For sure. Traffic was horrendous on northbound I-5 and SR 529 during the afternoon commute this past week. For those who had no choice but to slog through it, we commend you. For those who want to know when this headache will come to an end, we have answers. However you want to describe your Snohomish County drive over the past week, you are not alone and many of us here at WSDOT have been out there with you. Just. Stuck. The #SnoCoSqueeze expansion joint replacement project is currently replacing the joints on the left side of northbound I-5 Ebey Slough Bridge. To complete this work contractor crews redirected the SR 529 ramp (which typically merges into its own lane) directly onto I-5. This temporary merge created these terrible backups on I-5, SR 529 and the city streets of Everett and Marysville. Why is this work happening during the day? Northbound work occurs during the day (usually about 7 a.m. to 5 p.m.) behind a safety barrier to allow crews to get a head start on chipping the old joints out. It is time consuming work which is why we are working during the week. We re-striped I-5 to 3 narrow lanes multiple times throughout this project however the merge of 529 into I-5 has created larger backups than anticipated. The project is ahead of schedule! By working day and night, our contractor crews will be able to complete the work in seven weekends instead of the original eight. The entire project will be complete June 15. When a concerned commuter noticed a large pothole on an I-5 bridge in Federal Way, WSDOT was her first call. And when our overnight bridge maintenance crews received the report, they were ready to mobilize. Night crews champion the important preventative maintenance that keeps our highways safe. Although they tend to issues all over the Puget Sound region, few understand how much work they actually get done in a night. The state's infrastructure requires careful monitoring and care to ensure a long lifespan. Night bridge crews are the unsung heroes of the preventative maintenance world. Working demanding 10-hour shifts, they maintain and repair our bridges to try to prevent bigger problems later. Crews repair potholes, fix expansion joints, clean graffiti and trash, and install signs to keep highways in tip-top shape, among their many tasks. Inspecting and repairing expansion joints is one of the main jobs our overnight bridge maintenance crews do. ...and what isn't preventative maintenance? Preventative maintenance should not be mistaken for problem-free roadways – we wish! No matter how carefully we tend to our highways, infrastructure will inevitably age and require replacement. When thinking about maintenance, highways might be likened to a car: no matter how often you clean it, check it, and take it in for regular repairs, the car can't last forever. But by paying attention to that check engine light, you can give any vehicle a longer and safer life. maintenance staff stay busy keeping our roadways safe. How do crews perform preventative maintenance? Crews headed out to perform "mobile operations" on the Ship Canal Bridge. This means that they created a moving work zone, tending to several potholes scattered all over the roadway. These dangerous holes were filled with an asphalt product that creates a safe cover until permanent repair work can be performed. Every bridge is able to expand and contract with changing temperatures because of giant metal expansion joints. When a broken joint unexpectedly pops out into the roadway, it can cause some serious snarl. After a driver report earlier in the day, night crews were quick to check out the scene and make emergency repairs. 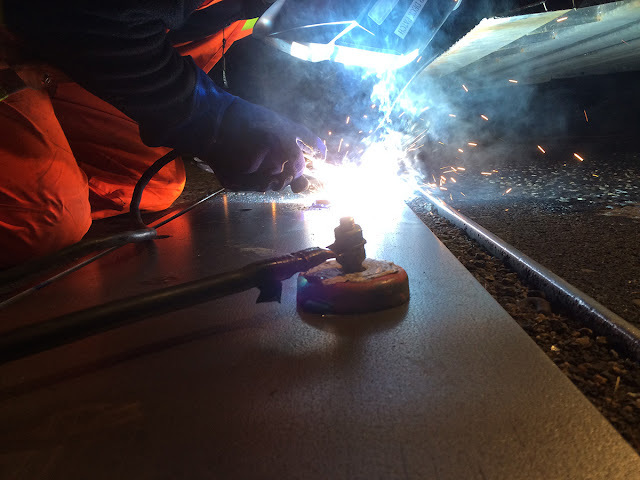 WSDOT night crews work tirelessly to keep highways free of graffiti. Wednesday was dedicated to such a cleanup of the Seattle express lanes – an issue WSDOT tackled after receiving your feedback. Thursdays are sometimes dedicated to emergency repairs. This week, things were a little more peaceful: crews spent the evening prepping materials and tools for next week's operations. Crews are ready for the new week and any emergencies it might bring. Over the week, night crews replaced three header joints across three lanes. That's 135 feet of repair! Additionally, they filled 15 potholes and cleaned 1,000 square feet of graffiti. That's a pretty busy week of repairs – and each is essential in keeping our highways safe. helping by slowing down and paying attention. Night crews do a ton to keep our highways safe and ready for the next morning's commute. Because they work in the dark of night, it is important for drivers to be extra mindful as they head past a work zone. By slowing down, keeping a safe distance from the car ahead, and being alert, drivers can help protect the crews that protect our highways. 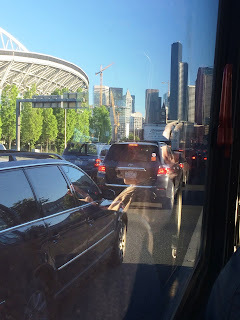 Last Friday you may remember that a fellow bus rider and I took part in a race to see whose #99closure commute was faster: mine by King County water taxi or her's on a King County Metro express bus. King County Metro express bus. She won, by 13 minutes. We decided we needed a rematch. This is the first full week of the #99closure. There are definitely more people on the road this week. If last Friday was a quiz, this week is a test. And next week just may be the final. Carrie again was aboard a King County Metro bus (the 21X) and I stuck to the West Seattle Water Taxi. Last Friday our commute times were 39 minutes for Carrie on the bus and 52 minutes for me on the water taxi. Here's what happened Monday and Tuesday. was slow headed into downtown Seattle. It works out well to catch the bus that comes right before my usual one (leaving home about 15 minutes earlier than usual). I was nervous that I wouldn't leave myself enough time, but I've been pleasantly surprised. The buses aren't crowded at all and, except for a choke point getting onto the West Seattle Bridge, it's a decent commute until we hit Fourth Avenue South in SoDo. On Monday there was a Seattle Police Department officer on hand to help manage traffic as we exited the West Seattle Bridge onto Fourth Avenue South. Tuesday we took a different route, using a transit-only street (the SODO Busway), and that saved time. Here's hoping that #99closure flies by and I can start sleeping in a little later again. In the meantime, I'm going to stay on my car-free commuting A-game! Believe it or not, I've reduced my commute time this week as compared to a normal day by leaving my house five minutes later. I've been near the end of the water taxi line and have had to park farther away from Seacrest Park. I'm sure not going to push my luck any more by leaving any later. The water taxi hauls. There were more passengers on board this week than Friday (221 Monday and 205 Tuesday) and the bike rack in the back has been full. Still, the crew is very good at ushering the crowd, even as many passengers snap pictures of their new commuting experience. The water taxi has several crew members answering questions as people wait in the long, snaking line waiting to get onto the speedy craft. On Tuesday, they took our payments as we waited in line instead of as we boarded. That was smart. It's kind of fun riding the taxi although I sensed the regulars are rolling their eyes at their new friends. Steve Peer reduced his usual commute time despite leaving 5 minutes later by using the King County Water Taxi. 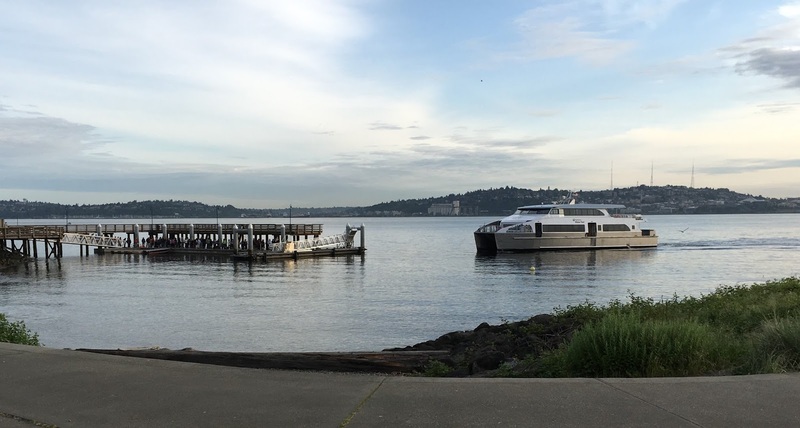 Riding the bus continues to be the faster choice from West Seattle but if you can correctly time the water taxi, she hauls across Elliot Bay much more quickly than the bus – leaving a boring commute in her wake. Up next: We'll continue to record our daily commute and report back in a week or so.